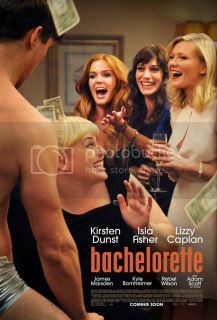 Based on Leslye Headland’s stage play, Bachelorette has already come under fire for its obvious similarities to 2011’s Bridesmaids. Provided that Headland’s play predates Bridesmaids by a few years, I reckon it’s worth noting that the two films have very little in common. Thematically, they operate in separate universes, with Bachelorette employing a much raunchier and emotionally vacuous tone. Upon Bridesmaids’ release, comparisons (and the picture’s marketing campaign) evoked Todd Phillips’ film, The Hangover. There’s a fairly clear distinction between those two films, particularly when acknowledging the far more gentler and sentimental glow of Bridesmaids to the more outlandish tone of The Hangover. When I say that Bachelorette is similar to The Hangover, I would understate the two films’ glaringly similar approach to “comedy” and narrative incongruity. The two are congenial films, joined at the hip, sharing the same brain and pumping cocaine-laden blood through the same heart. Once a tight-knit foursome, high school friends in Regan (Kirsten Dunst), Gena (Lizzy Caplain), and Katie (Isla Fisher) reunite for Becky’s (Rebel Wilson) wedding. Known as “pig face”, Becky was, amongst the foursome, considered the least likely to get married first. Regan, Gena, and Katie futilely attempt to conceal their disapproval of the wedding, largely by indulging in the finer things: snorting coke and ruining Becky’s ample-sized wedding dress. The bogus journey begins as the trio, along with help from the dunderheaded groomsmen attempt to fix the dress, which only becomes increasingly more dilapidated as the night leads them from strip clubs and swimming pools. Bachelorette is an especially evil film in all regards. It’s anchored by a plot device that was caused from an act of cruel obscenity. The cruelty on display is particularly off-putting, as it’s a film that attempts to gives its characters a happy ending. This works conversely with a film like Jason Reitman’s Young Adult, which took a similar character but was bold enough to acknowledge the cruelty in people. There’s no plausible justification for Bachelorette’s ooey-gooey second act– it’s merely there as a means of wrapping up the narrative. Much like Phillips’ The Hangover, Bachelorette possesses its share of one-liners that had me laughing. My overarching disappointment for these sorts of films doesn’t make me immune to a good joke. And the film certainly has a share of good laughs. Most of the time, I can just put the film to the side and simply appreciate a simple-minded comedy- it’s largely what I did with recent films like The Campaign and The Watch. The deplorability of films like The Hangover and Bachelorette is too overwhelming to excuse – its extreme raunchiness for the purpose of being extreme. It’s absurd without understanding the means of its usage - comedic or otherwise.